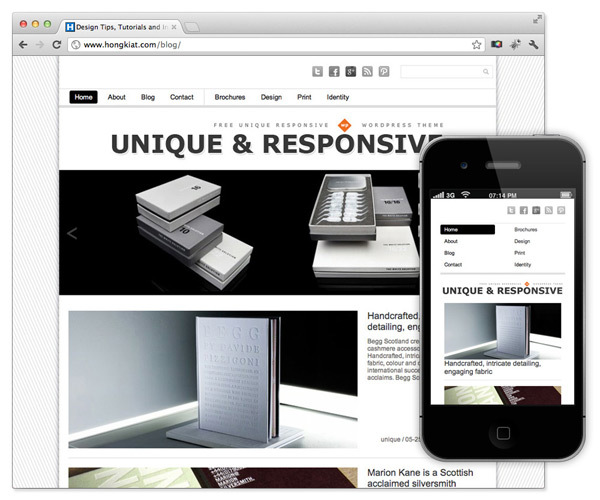 All WordPress Themes are fully responsive based up on twitter bootstrap framework. 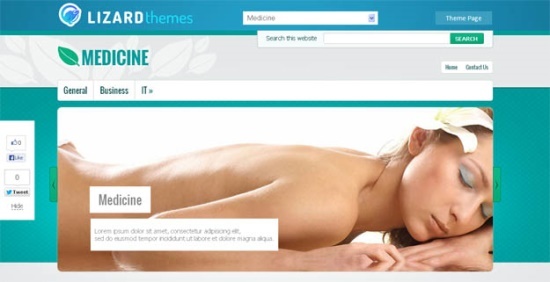 The theme is free, responsive and has all the features of premium themes. 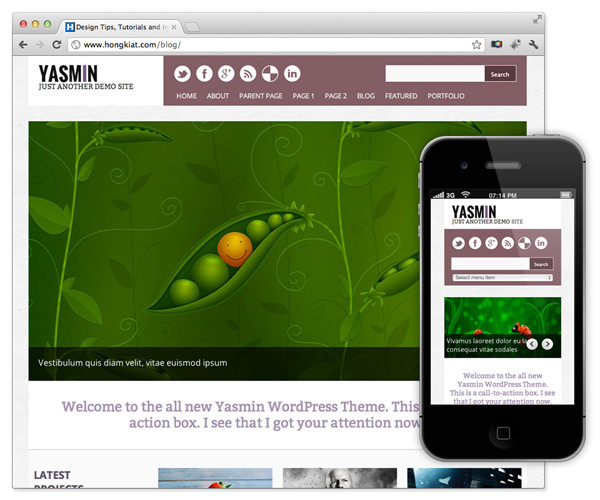 Create beautiful websites live with list Best Free Responsive WordPress Themes! 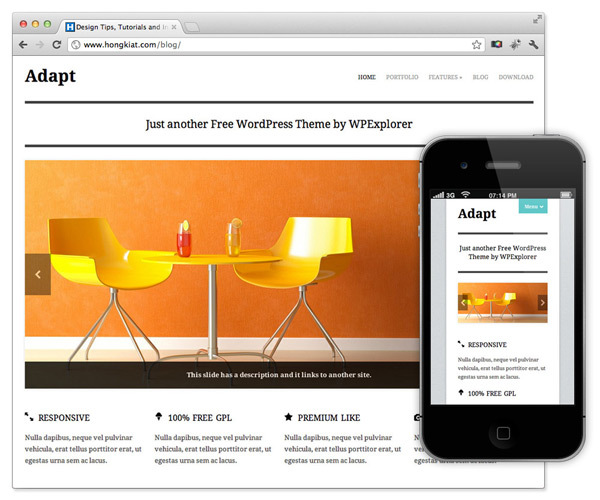 Clippy WordPress theme – Simple, responsive, pin-style theme for your personal blog. 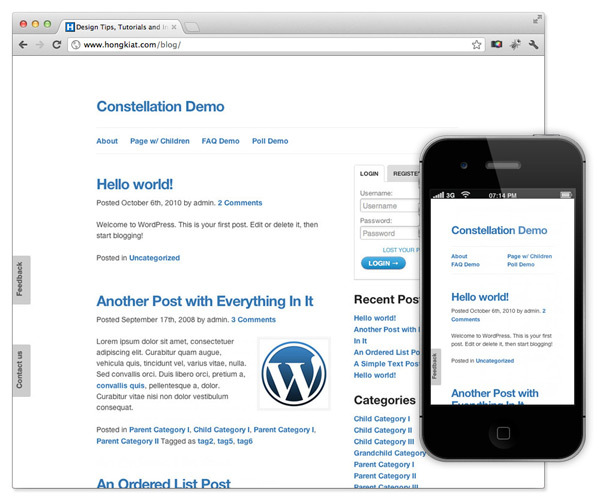 The Constellation free wordpress theme to the left is no longer being actively maintained. 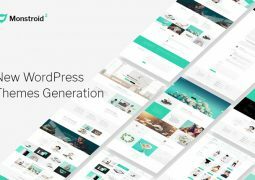 Browse the free wordpress themes below to get some inspiration. 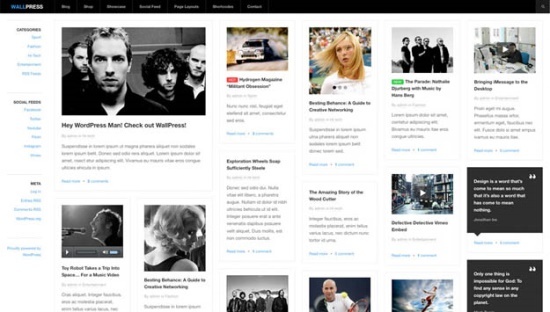 Ari is a free WordPress theme with a clean, minimalistic design. The theme has a responsive layout that is optimized for different browser sizes and mobile devices (tablet pcs or modern smartphones). 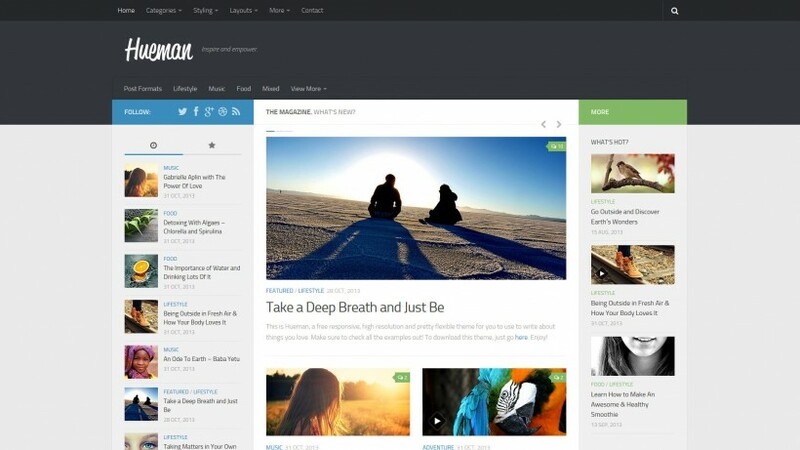 Ari is a simple to use, flexible blog theme best suited for small blogs or personal blogging. You can easily change the background, text and link colors in the theme option page. In the theme options you can also change the logo by using your own logo image. With Ari you can start blogging without having to set up a lot of things and your readers can enjoy reading your blog posts from their tablets pc or smartphone. 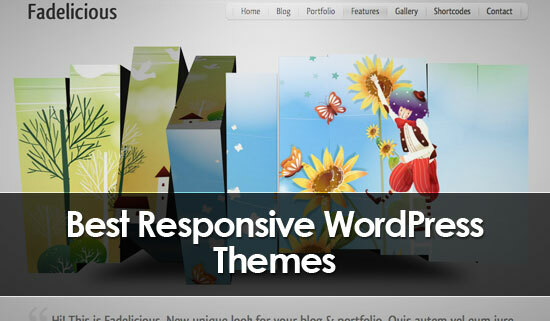 WallPress is a Free Responsive WordPress Theme which lets your content shine. 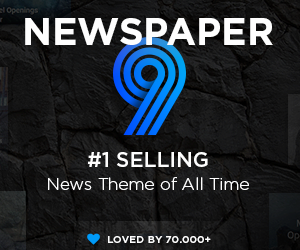 Be it an online portfolio, newspaper or magazine, all your important social content comes together at one place. Twitter, Facebook, Instagram, Flickr and Vimeo are ready to be plugged in with DW Social Feed. 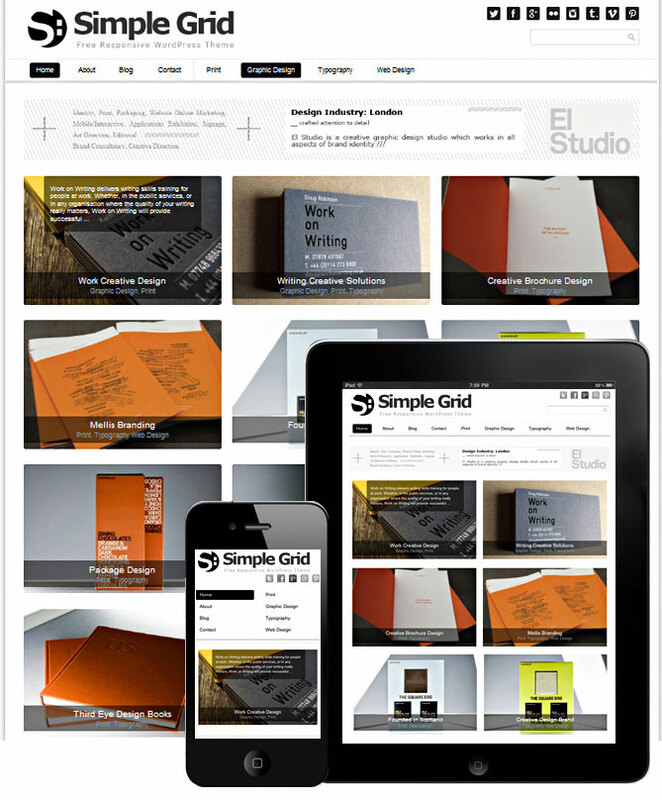 Simple Grid Theme Responsive is a WordPress Theme with mobile and tablet responsive design. 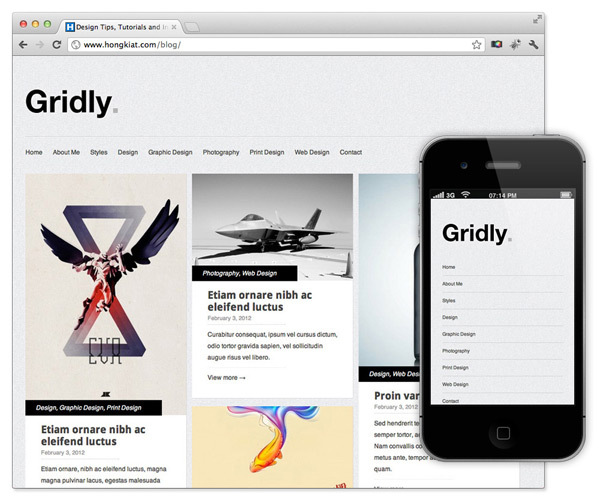 Grid like design Theme is perfect for any creative agency to showcase their portfolio. Inspired by the works of El-Studio creative graphic design studio. 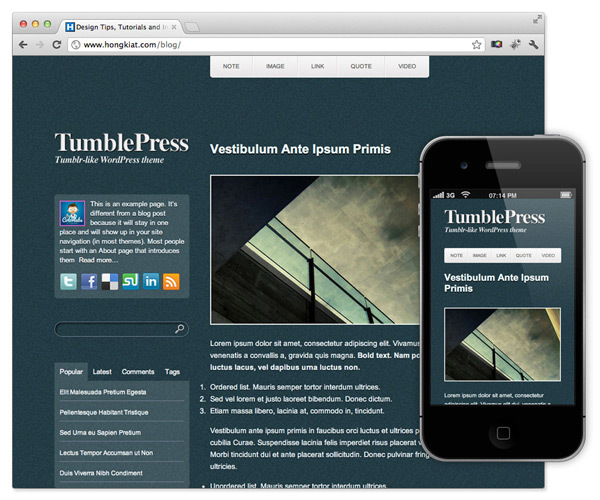 Unique Theme Responsive is a WordPress Theme with mobile and tablet responsive design. 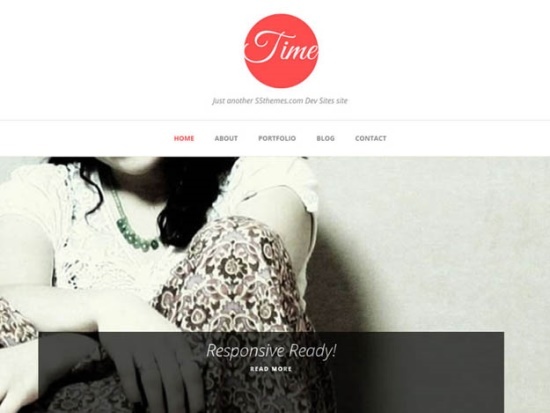 Great grid like theme for portfolio showcase and for creative blogging . Inspired by the works of El-Studio creative graphic design studio. DW Minion is a simple and clean WordPress Blog Theme. 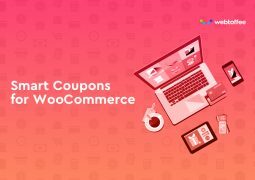 This theme is designed which aims for a minimal and simple blog while showing off the most of your content. 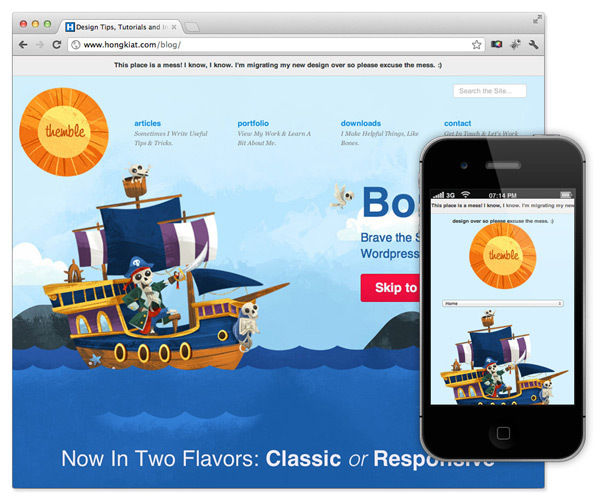 DW Minion supports responsive design and it’s great to blog anytime anywhere you want. 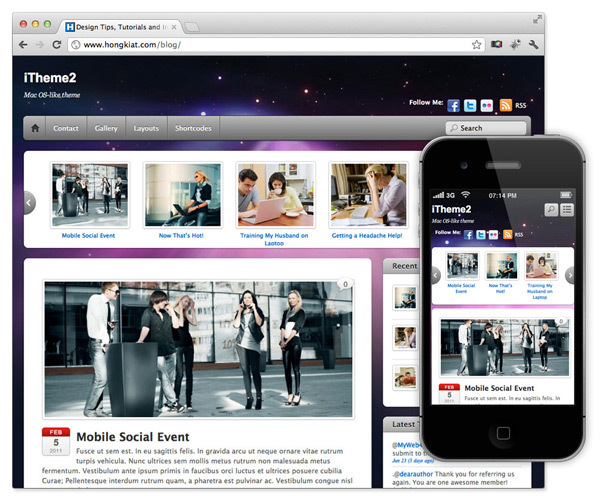 Social sharing is focused and various post formats are supported. 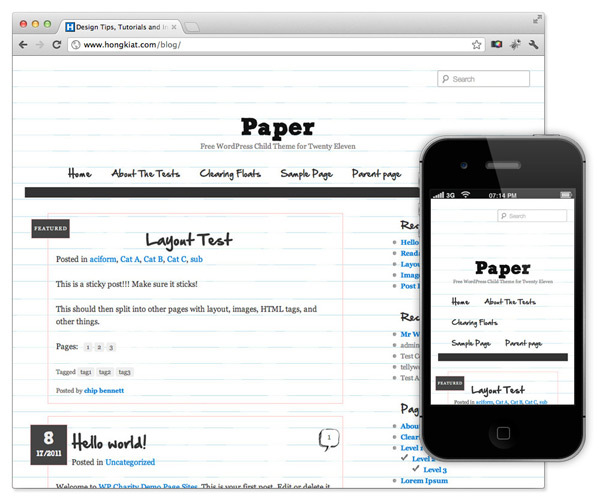 The theme is available for free, so grab it and start blogging. You take pictures, you write stories and opinions, you make videos, you link to cool sites all the time. Tumblr is perfect for that but there’s one flaw, you don’t get to control everything as easy as you would with WordPress. 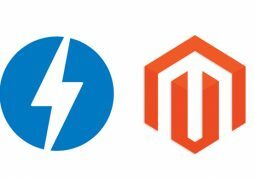 You’ve got no control over your database or server and you can’t even do anything with its SEO. 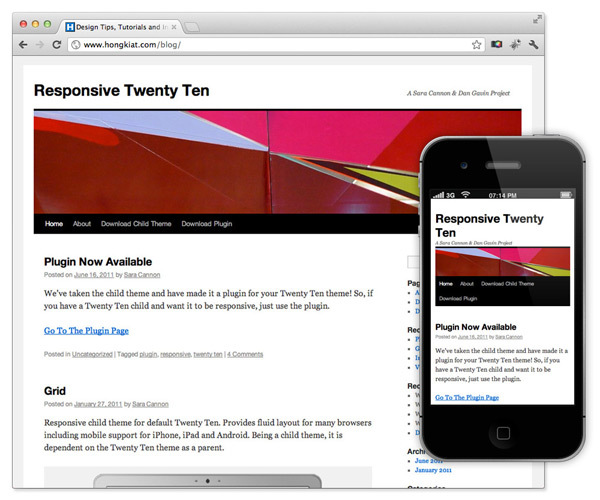 Responsive child theme for default Twenty Ten. 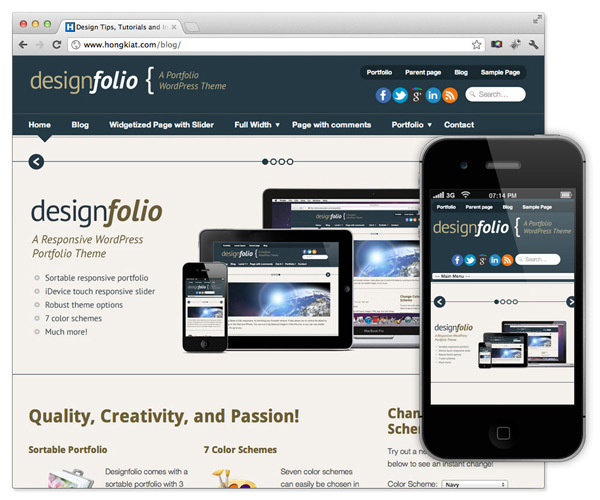 Provides fluid layout for many browsers including mobile support for iPhone, iPad and Android. Being a child theme, it is dependent on the Twenty Ten theme as a parent. 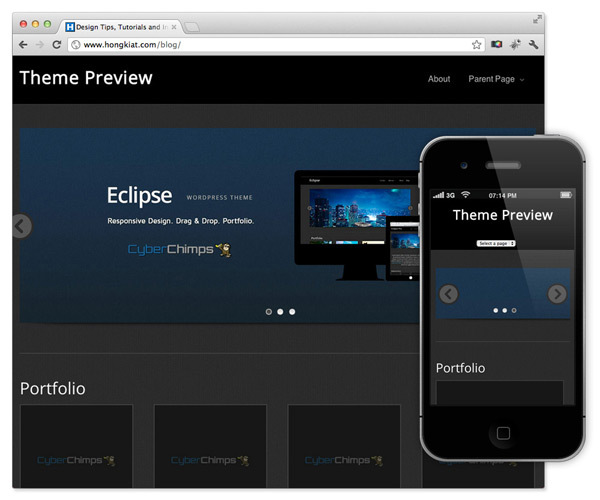 Eclipse Free Responsive Portfolio WordPress Theme with Drag and Drop Page Elements. 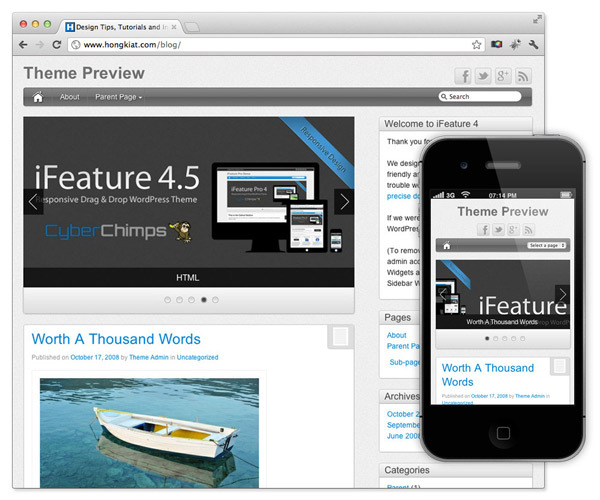 Eclipse offers the same advanced functionality as CyberChimps other WordPress Themes including Drag and Drop Page Elements, and a Responsive Design that responds automatically to mobile devices such as the iPhone, iPad, and Android. 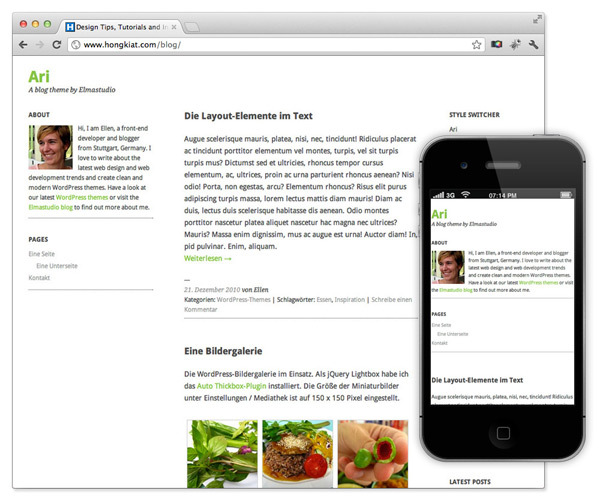 Eclipse includes Drag and Drop Elements such as the Portfolio Element, Responsive Feature Slider, Twitter bar, and Recent Posts Section. 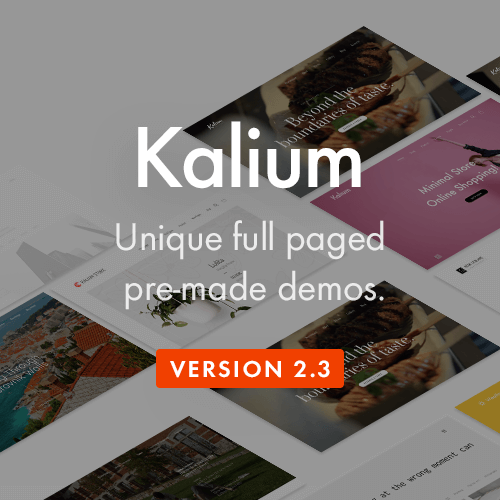 All of which can be used on a per-page basis using Drag and Drop Page Options that also include sidebar and layout options giving you the power to control the look and feel of every page of your website. 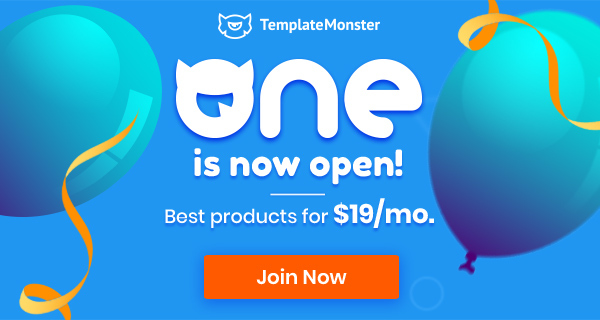 iFeature 5 Free lets you create amazing responsive websites that you can control on any touch device including the iPad, iPhone, and Android devices. iFeature 5 Free also includes the power of a several plugins in a single theme allowing you to setup an entire website in minutes with touch friendly Drag and Drop Options on a per-page basis allowing you control the look and feel of every page. 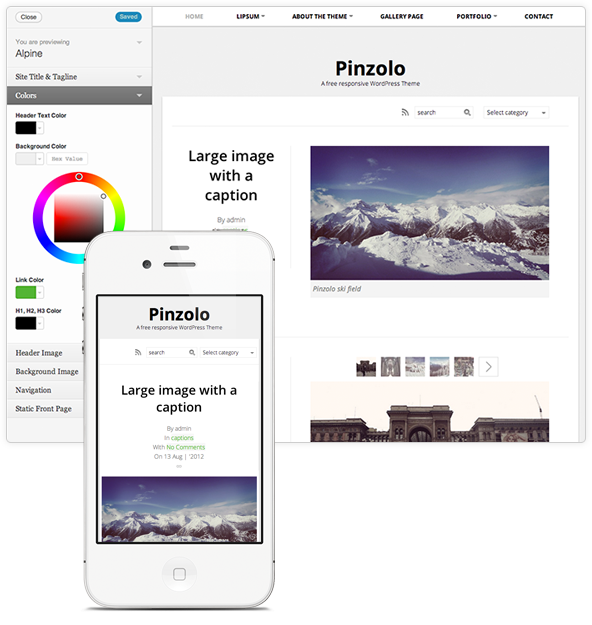 Make Responsive Theme part of your website design, or upgrade your current one to a mobile friendly Theme that automatically adapts to any screen resolution or device. 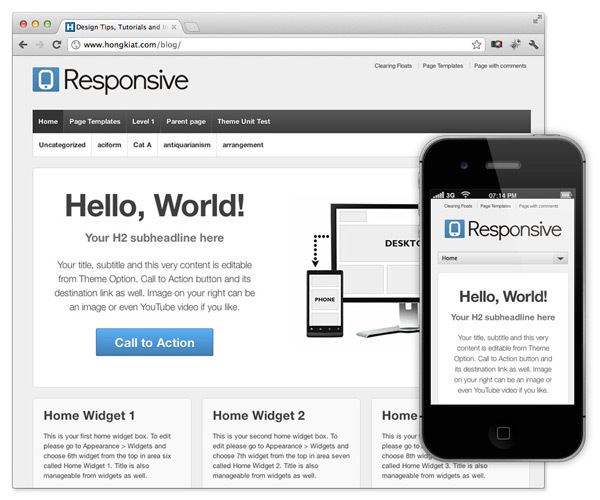 Responsive holds the record as the world’s most popular, downloaded and used theme of all time. 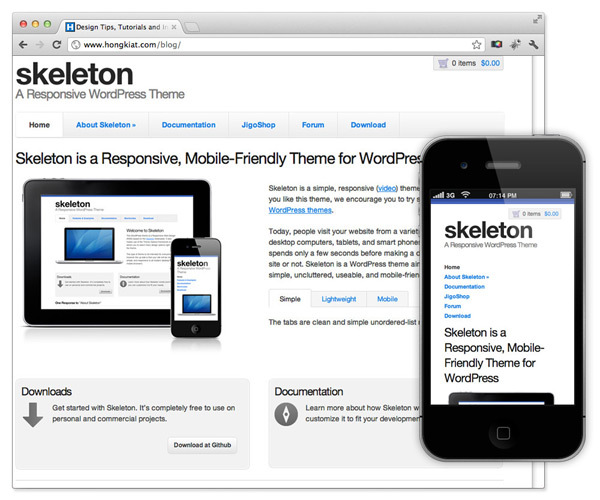 Skeleton is a simple, responsive WordPress theme based on the Skeleton Boilerplate. It has several useful shortcodes, such as tabs, toggles, cross-browser CSS3 buttons, and layout columns. It also includes a bbPress skin/stylesheet and sample child theme. Bones is a WordPress Theme for Developers. 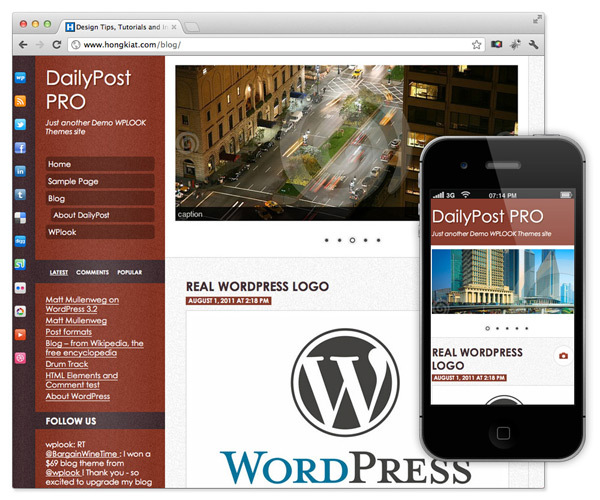 DailyPost PRO is designed for personal Blogs. 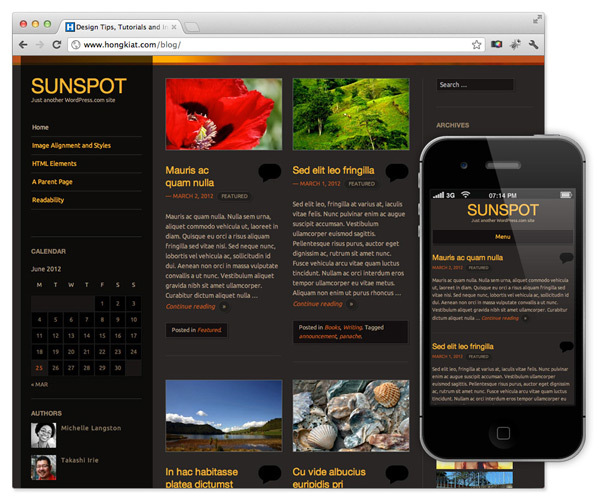 It is highly customizable and can be viewed on computers, tablets, and mobile devices. 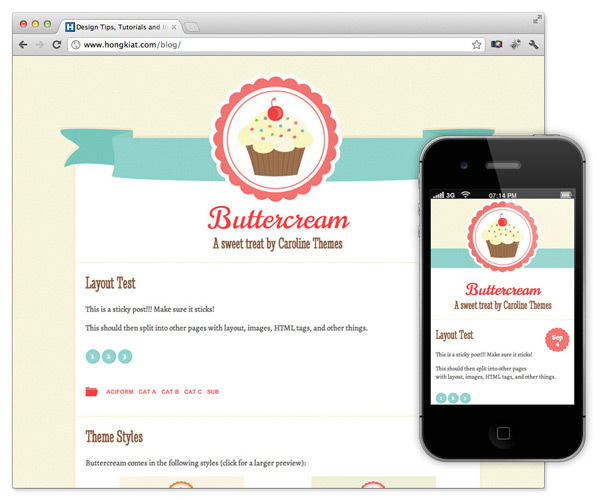 Buttercream is a sweet treat for your blog or website. 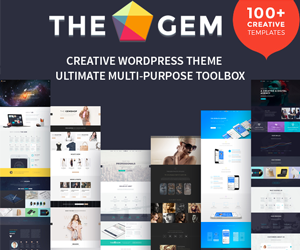 This theme supports all post formats, an optional responsive design for smaller screens (perfect for iPhone, iPad and other mobile devices), custom backgrounds, a custom pop-up menu and three widget-ready sidebars in the footer. A sharp theme with subtle grid lines and sun-splashed accents, Sunspot is a great all-purpose blogging canvas, especially for those who prefer a dark color scheme. It also features a layout that adapts gracefully to fit smaller screens, ensuring that your readers can enjoy your content on a variety of devices. 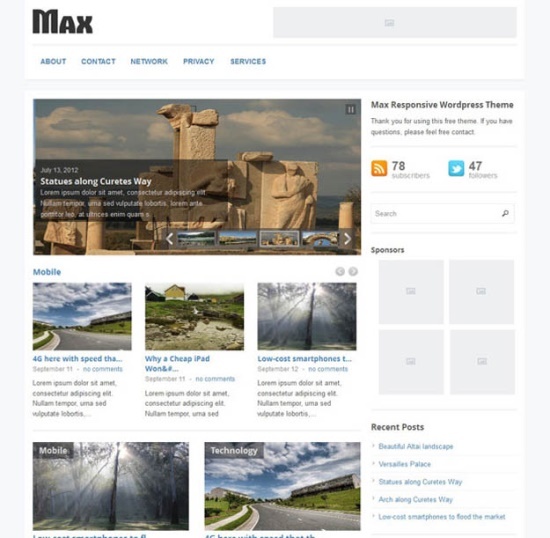 A free, fully featured, responsive high resolution magazine & blog theme without compromise. 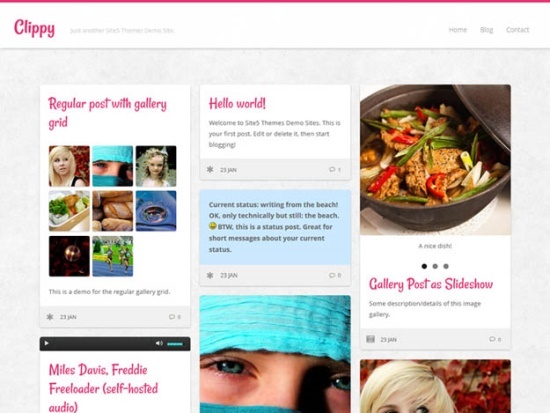 Hueman presents what you love to write about in a visual & user-friendly way on all devices.